Matt Hawkins isn’t a wizard. He’s not a werewolf, either. He doesn’t talk to ghosts, though he thinks he might like to see one some day. Matt’s just an ordinary, everyday kind of guy. So why is the oldest and meanest vampire in town suddenly gunning—or should that be ‘fanging’?—for him? Maybe it’s his social skills, or lack thereof—but it wasn’t his fault he lost his pants in the middle of the mall. Perhaps it’s because he’s on nickname basis with the ghoul in a local cemetery. Then there’s the outside chance it’s the fact Matt’s one half of the vampire slaying team that is Night Call. His partner is Mercy, a pint sized fighting machine with a killer wardrobe—and she’s the only tame vampire in existence. Vampires. Werewolves. Ghouls. I can’t recall a time in my earliest readings when these creatures were nothing but dangerous and avoiding them as much as possible was to be preferred. Despite a large number of paranormal romance novels smoothing the rough edges of these creatures and making them subject of exotic love affairs, reducing their threat to a flimsy state, there are still stories out there that return these beings to their menacing nature. The latest novel to fall into my arms and hinting at such a restoration is an urban fantasy by L.J. 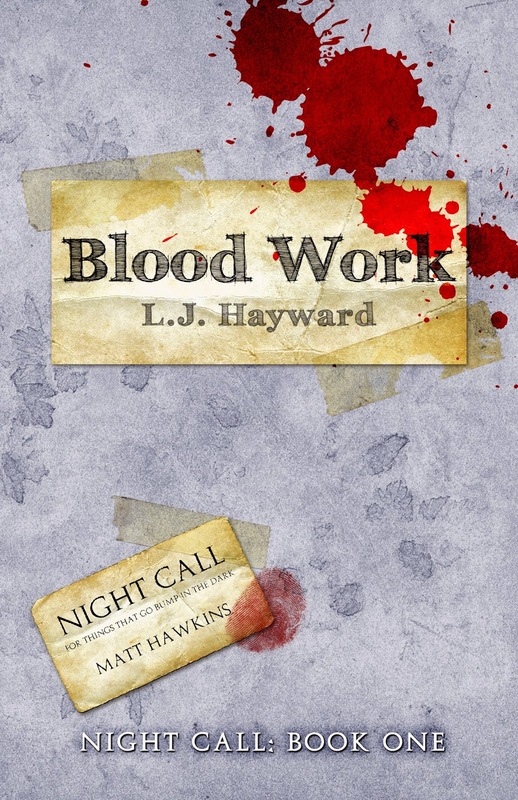 Hayward, “Blood Work”. To a certain extent it seems the basic concept behind L.J. Hayward’s story is nothing we didn’t see before, a paranormal investigator draws the unwanted attention of a very powerful creature and the two chase each other in an attempt to bring their business to a conclusion. But there is more to “Blood Work” than this central plot leaves to be seen from the beginning. For starters we have Matthew Hawkins, the main character and the paranormal investigator in question, and it is Matt Hawkins who finds himself the subject of a private investigation as well, an enigmatic woman hiring a specialized company to discover his whereabouts. Approaching the main character from these two different angles gives L.J. Hayward the opportunity to place Matt Hawkins into the gray area of morality, he is a human being with qualities and flaws, courses of action we approve or disapprove, a temperament that could be appealing to some and appalling to others. Matthew Hawkins is as three-dimensional character as we can get and that forms one of the strong pillars on which “Blood Work” is supported. The characterization draws power not only from Matt Hawkins being investigator and investigated, but also from the fact that these two sides are approached from different perspectives, L.J. Hayward switches between first person narrative in case of Matt Hawkins investigator and third person narrative in case of Matt Hawkins investigated. It is the perfect opportunity to create solid scaffolding for building a character. It is also an ideal entry point for another main character, in this situation Erin McRea. Not as developed as Matthew Hawkins she is still a welcomed and strong presence within the plot. Of course, Erin McRea does not benefit from two viewpoints in support of the character’s construction, but it is not this aspect preventing Erin reaching its full potential, but a couple of emotional elements left hanging. As is the case with one facet of Matt Hawkins, a relationship with his brother that is only hinted at and that it seems to have significance in regard of Matt’s character development. L.J. Hayward’s “Blood Work” doesn’t have only good characterization to back it up, but also a healthy dose of action, mystery and humor. L.J. Hayward throws the reader head first into straight action, the first couple of chapters are rich in energetic and frantic scenes. But while she makes a stand for the physical part of the story she also feeds the cerebral side with a well-placed intrigue. And along the novel crisscrossing between the two L.J. Hayward energizes the plot without repeatedly taking the same course of action, but without losing the balance that in the end rounds the intrigue in a cursive manner. Helping along are the dialogues of “Blood Work”, especially when Matt Hawkins is involved. Often pleasant, intelligent, playful or hilarious the exchange between the characters prompt a naturalness to the situations and relationships they’re in. They contribute nicely to the well functional capacity of the story. Top these with an interesting situation regarding vampires feeding and the different blood types, a ghoul with an involuntary sense of humor (“That freakin’ ghost tour came through. Here half the night they were. All pretending to be jumpy and scared and squealing and stuff. Gave me the worst headache. I’ve hardly slept all day.”), plus an unusual werewolf transformation and the degree of entertainment for the reader is up to the recommended levels. There are moments when “Blood Work” wobbles a bit and it would have still needed a bit of polishing in my opinion. Nothing major, there is nothing troublesome on the whole at the little parts that required mending, but they are still nudging the back of my mind. Matt Hawkins seems to acquire at some point in his past strong psychic power, but I still failed to find how he has come to be in this position. Also, with an expensive car, a house in a posh neighborhood and a compulsive spending behavior I wondered more than once how Matt, self-employed and running not the most profitable of businesses, has the financial capacity to afford all these. And I failed each time to find my answer. But more pressing is that we are told that Mercy, a vampire close to being Matt’s sidekick, is capable only of trained and triggered responses and yet she displays enough personal attitude to render almost null an automatic behavior. For instance, more than once Mercy plays favorites when it comes to outfit choices and even Matt states at some point: “Mental note, pay more attention to what clothes Mercy buys. eBay – a vampire tamer’s worst enemy.” It certainly doesn’t look like mechanical reaction. And to put “Blood Work” better on its feet an extra pair or two of proof-reading eyes would have helped. I am not an avid reader of urban fantasy, but if all those I read are as good as L.J. Hayward’s novel I can hardly find a reason for complaint. As a matter of fact, with no consideration for what genre they’re fitted in, if all the novels are at least as fun, fast-paced and gripping as “Blood Work” the readers are exclusive beneficiaries of joyful readings.